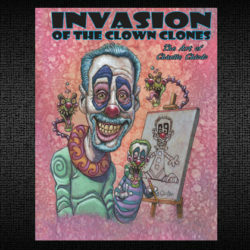 Bill Nelson returns to his roots to revisit Chaney’s make-up genius with this deluxe hardbound limited edition showcasing not only his original portfolio drawings, but also more than 50 brand new color and black & white illustrations, accompanied by Nelson’s insightful personal commentary. In 1970, internationally renowned artist Bill Nelson created The Lon Chaney Portfolio, an exquisitely rendered series of black and white illustrations devoted to Hollywood’s beloved “Man of a Thousand Faces.” The collection showcased portraits from many of Chaney’s most memorable films, including The Phantom of the Opera, The Hunchback of Notre Dame, London After Midnight, The Penalty and Laugh, Clown, Laugh. At the time, Nelson had made a name for himself providing standout cover art and interior illustrations for such genre magazines as Cinefantastique, The Monster Times, Gore Creatures, Midnight Marquee and Photon, though in years to come, his work would appear in Time, Newsweek, The New Yorker, Rolling Stone, Esquire, both the Los Angeles and New York Times, and even on a series of postage stamps dedicated to famous Big Band orchestra leaders for the United States Postal Service. Nelson’s illustrations and sculptures have earned him a place in the prestigious Who’s Who in America while garnering over 900 awards, including gold medals from the New York Art Director’s Guild and a silver medal from The Society of Illustrators for his portrait of Chaney as “Tito” from Laugh, Clown, Laugh. Now, 40 years later, Nelson returns to his roots to revisit Chaney’s make-up genius with this deluxe hardbound limited edition showcasing not only his original portfolio drawings, but also more than 50 brand new color and black & white illustrations, accompanied by Nelson’s insightful personal commentary. Also included are introductions from 7-time Academy Award winning make-up artist Rick Baker and Ron Chaney, Lon Sr.’s great grandson and owner of Chaney Enterprises. This lavish tribute is being offered in two hardcover editions, both 160-pages and measuring 10-1/2 x 14”. The regular version, limited to 1,000 copies, is $49.95, while the second includes an original Lon Chaney sketch by Nelson for $100 and is strictly limited to 100 copies.